Managing human resources, staff and volunteers, in a challenging environment is critical to your success. Identifying, hiring, training and retaining the people you need to achieve your goals can be a daunting task. To make your job easier, you need good hiring processes, effective performance management systems, and clearly identified skills for now and in the future. Then, you need to attract the right people. * Our Volunteer Management offering can assess the status of current volunteer programs, identify and offer processes to support recruitment, policy gaps, orientation and training and coaching. In alignment with HR practices, processes for developing volunteer role descriptions, record keeping, issues and recognition can also be addressed. 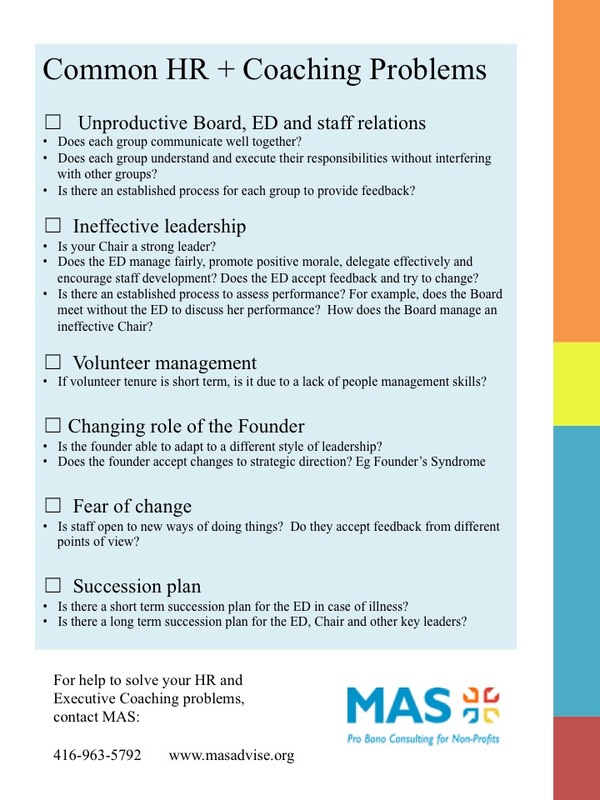 This checklist should be completed by any staff to identify potential HR problem areas that may be preventing you from effectively achieving your mission. For assistance fill in our Request for Assistance form here and MAS can help by advising on HR and organizational issues. MAS have created a session targeted to board members, Executive Directors and management teams of charities and not for profits. The offering is intended to enhance the leadership skills of your team. This session is offered in a group format and requires a minimum of 8 participants from your organization to make the session worthwhile. When your organization relies on dedicated staff and volunteers to execute a multitude of tasks that sustain your organization and meet the needs of your clients, you want to create a positive environment that both attracts and retains the best. Contact MAS today and let us help you build a workplace that is rewarding, productive and successful.